Standard gear includes power front seats (heated and cooled), LED headlamps, head-up display and seven-inch touchscreen. Service intervals are 12 months/10,000km. If you drive the average 15,000km a year, four services in three years will cost $1136. Warranty is above average at five years/unlimited km. Premium paint, free on the Subaru, adds $595. Daring deviation from the small SUV formula or a gratuitous styling exercise? It's a subjective call. Few compact crossovers, Toyota's C-HR apart, attract such attention. The interior is much more conventional. Restricted rear space suits occasional adult use but the seats are comfortable and high-set to give a decent outward view. The boot is good for a vehicle this size at 361L. The 1.6-litre turbo (130kW/264Nm) and seven-speed auto endow a more-than-respectable turn of pace that shames the Subaru. You can have your cake and eat it too - claimed thirst is 6.7L/100km against the XV's 7.0L. The dual-clutch auto can hesitate off the line and occasionally clunks when shifting in the lower gears but operates pretty well once you're under way. The Highlander rates highly for active tech, the latest "must-have" feature. Standard are lane keeping assist, blind spot monitor, autonomous emergency braking, rear cross traffic alert and driver drowsiness monitor. ANCAP rates it a five-star car with a score of 35.07/37. There are six airbags, front and rear parking sensors, auto-dipping headlamps and reversing camera. The suspension tune mirrors the sporty look and can be busy over small corrugations. There's also a touch more body roll around corners than the XV exhibits. Three driving modes adjust throttle, steering and transmission response. As a city car - its intended use - it rides and handles as well as most. 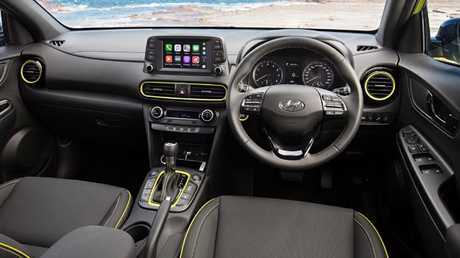 The XV range-topper matches pretty much all of the Kona's kit, bolstered by an eight-inch touchscreen with satnav, adaptive cruise control and dual-zone climate control, though it misses out on the Hyundai's wireless phone charging. Servicing is at 12 months/12,500km and the first three visits will total $1298. Warranty flip side: Subaru's is three years. 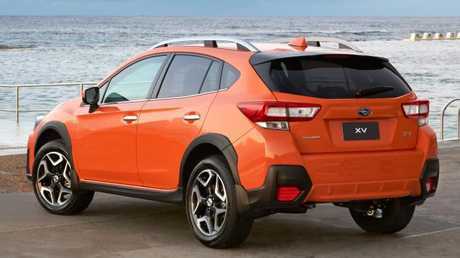 A high-riding wagon rather than an SUV and with more rear legroom, the XV is a realistic four-seat proposition. The cargo area is just 310L, though the tailgate opening is wider and lower than before. 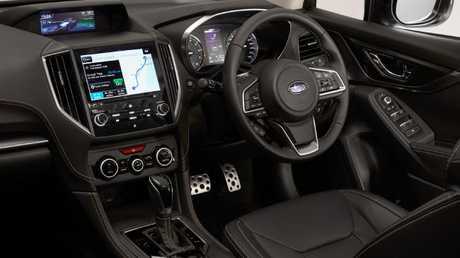 The exterior design isn't as adventurous as the Kona but interior quality is certainly on par. In keeping with Subaru's all-wheel drive emphasis, there's some underbody reinforcement … but no full-size spare. Subaru's 2.0-litre boxer (115kW/196Nm), mated to a continuously variable transmission, is smooth but comparatively leisurely, taking more than 10 secs to hit triple figures. 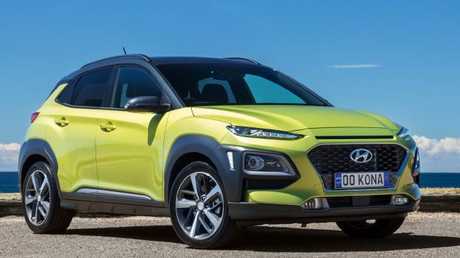 Compact SUV buyers aren't typically interested in lap times but the Kona mixes better performance with marginally better fuel use. The 1400kg braked towing capacity tops the Kona's 1250kg. The XV doesn't deviate from the script. 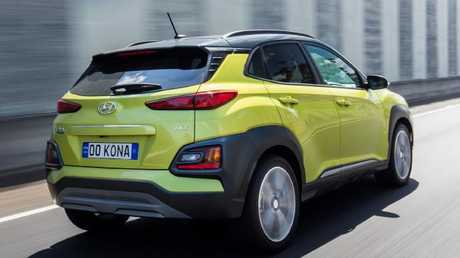 It runs all of the active driving tech found on the Kona, adding tyre pressure monitor, and its rear cross-traffic alert is bolstered by automated rear braking if sensors detect an obstacle at low speed. It earned a five-star ANCAP rating with an impressive 35.8/37 score. 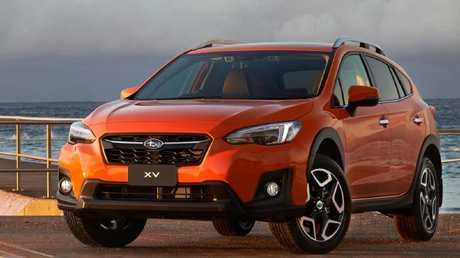 It is hard to fault the way the XV handles around town or on the freeway and it comes into its own on back roads or rutted gravel tracks where corrugations and potholes don't unsettle it. Steering is light, the suspension balances compliance and cornering and outward vision is better than SUVs can muster. As a utilitarian SUV, the Subaru has the slightest of edges, though trendy types understandably will gravitate to the Kona's extra visual and performance attributes.